In Watershed Days, the reader embarks on a wide array of adventures shared in seasonal order over a period of two years, 2005-2007, yet spanning in memory back to the author’s youth. Infused with a blend of ruggedness and sensitivity, the writing is ripe, wry, and roving, ever attuned to the natural world. When the focus is not on the immediate homestead activities of making apple butter, telling stories to his child at bedtime, coming to terms with an aging dog, planting fruit trees, building garden beds, stacking firewood, butchering hogs, keeping chickens, hunting deer behind the barn, Moeckel zooms in on his escapes to the near woods and rivers, creeks and coasts—surfing, canoeing, fishing, even skateboarding on the Blue Ridge Parkway. 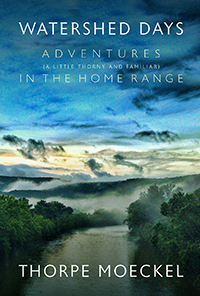 The twenty-four adventures are woven into a subtle, cohesive whole, providing a textured portrait of a young man, his family, and their evolving intimacy and distance with each other and the natural world, the 18-acre homestead to which they have just moved and started working, as well as the woods and rivers of Virginia’s Jefferson National Forest just down Arcadia Road.